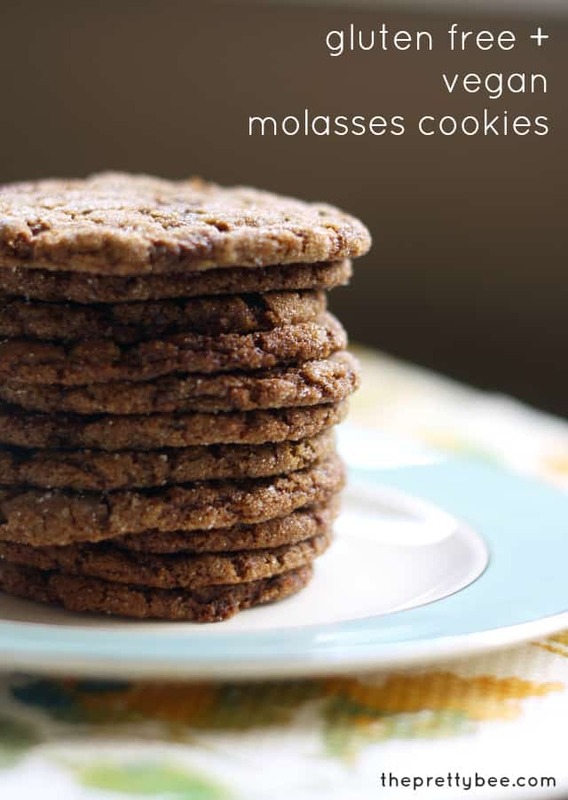 Home » Desserts » Gluten Free Vegan Molasses Cookies. Gluten Free Vegan Molasses Cookies. Gluten free vegan molasses cookies are perfectly chewy and crisp…just right for enjoying with a cup of tea! These spiced cookies are a must make recipe for the holiday season. There’s nothing nicer than some Christmas carols on the radio, a cup of hot chocolate, and a batch of gluten free vegan molasses cookies in the oven. The scent of cinnamon and ginger just says Christmas to me. If you’re new to gluten free vegan holiday baking, you might wonder if these vegan molasses cookies will taste as good as the original. 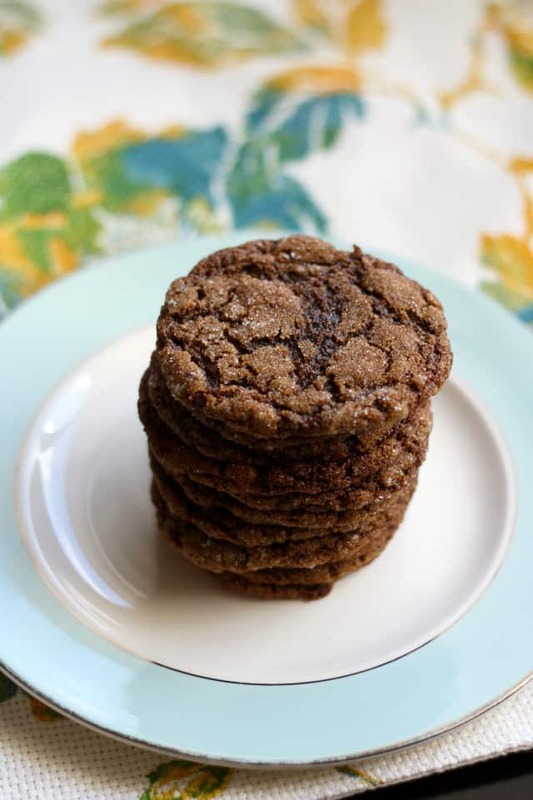 Yes, these vegan and gluten free molasses cookies are delicious, chewy, and just as wonderful as the classic recipe. Some simple substitutions make this recipe easy to make. 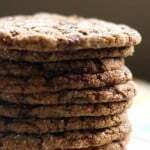 Almond meal gives these cookies a nice chewy texture. If you can’t do nuts, you could try ground pumpkin seeds or sunflower seeds. Even oat flour would add a nice contrast to the gluten free flour blend. How do you make seed flour? Take the seeds of your choice (make sure they are free of nut cross contamination), and grind them into a fairly fine flour using a mini food processor. If you are grinding a ton of seed flour, you can use a regular food processor, but I find if I’m just making a cup or so, the mini processor works best. What is the difference between molasses cookies and gingersnaps? 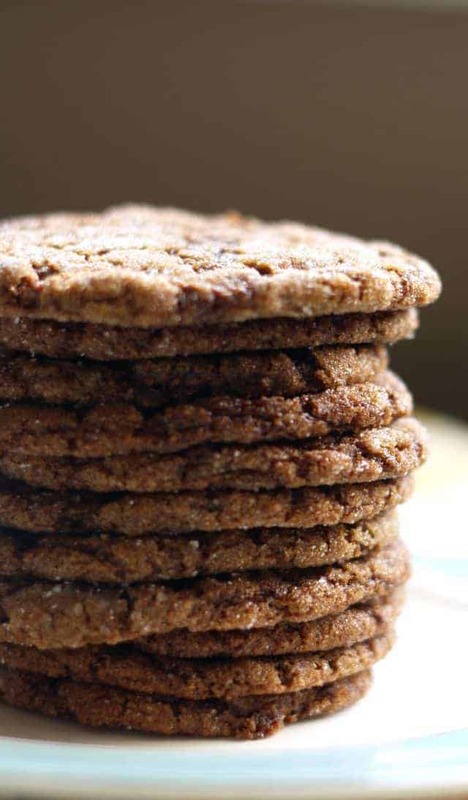 Molasses cookies are chewy, but gingersnaps are usually crispy. Both have a delicious strong and spicy flavor. How long is molasses good for? If you store molasses in a cool, dry place, unopened molasses should be good for at least two years. Opened molasses should be good for at least one year. Read more about storing molasses here. Chewy, spicy, gluten free vegan molasses cookies. This recipe is a classic for the holiday season! Mix your ground flax seed and water in a small bowl or cup and let sit for about five minutes until it turns to a gel like consistency. In a medium bowl, combine flour, almond meal, spices, and baking soda and set aside. In a large bowl, mix the buttery spread and sugar. Add the flax egg, vanilla, and molasses and stir. Add the dry ingredients a little at a time and stir until combined. Refrigerate the dough for at least a half an hour. Take a small amount of dough and roll into a ball – it should be about 3/4 of an inch in diameter. Roll in the granulated sugar and place on the parchment lined cookie sheet. Leave space in between the balls, these cookies will spread quite a bit. You should be able to bake a dozen at a time. Bake at 350 degrees for ten minutes. Ten minutes was prefect for my oven – the cookies were thin, but still soft and very chewy. Just a couple minutes more produced crispy cookies. So it’s a fine line between chewy and crispy with these. Let cool for five minutes and then transfer to a plate to continue cooling. A wire rack isn’t recommended because these are fragile when they are hot. Now that we can't eat almonds, I make these with oat flour, or a mix of oat flour and pumpkin seed flour. To make seed flour, just grind the seeds of your choice in a mini food processor until they make a very fine flour. Store these cookies in an airtight container - they should stay fresh for about one week. If you want to make the dough ahead of time, you can roll it into a log, wrap in plastic wrap, and freeze it. When you're ready to make them, just slice off cookies and bake as usual. Want more gluten free Christmas cookie ideas? Take a look at this list of 50 gluten free cookie recipes! This post was originally published on December 13, 2013. It has been updated to be more allergy friendly. « Pumpkin Chocolate Chip Oatmeal Cookies. Yay! Thanks for letting me know! So glad you loved them. I belive you preheat the oven only once the dough is in the fridge and not at the beginning of the preparation…otherwise its a precious waste of energy (oven). True! I will adjust that! These are SO good! I can’t stop eating them! Oh good, so glad you like them! Uppercase T is tablespoon and lowercase is teaspoon? Have fun making earrings today!